I have done much camping in my days…many of us have. As a child I loved it, then as a young woman in love, we camped all over Europe during the summers. Some camping in the mountains, hiking and some camping with my students…but now, it is over. 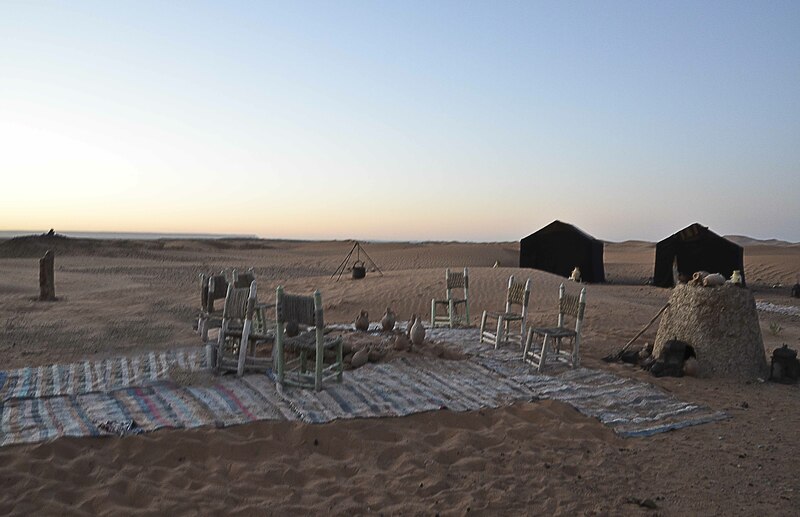 If staying at a Berber camp for two days, in tents, and having a camp fire in The Sahara Desert, is camping, then I have camped again… last month. Our tent was the one to the right, with a yellow entrance carpet. At the far end of the camp were the toilets – and to my great disappointment, they were ordinary toilets – just like those at home…The washing basins outdoors though. 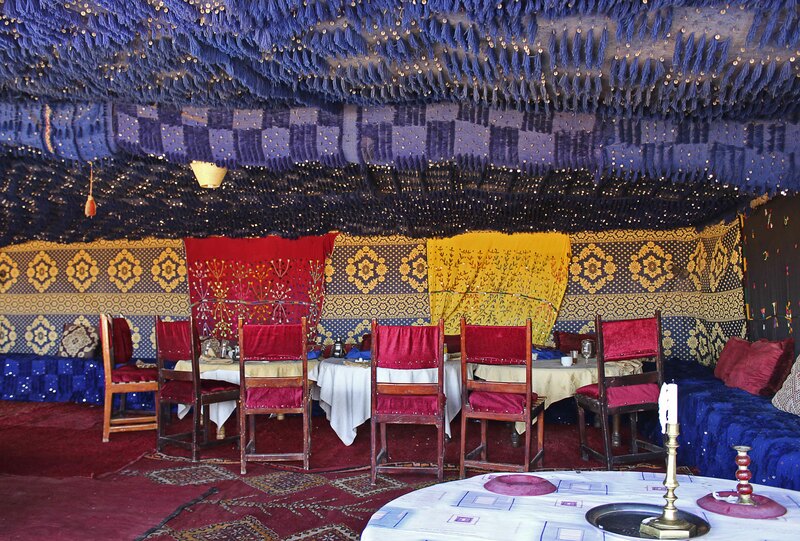 We had some delicious tagine by candle light in the main tent, and then we sat by the fire under the stars, listening to each others’ stories. Just existing. We all slept well that night, but some of us woke up early…trying to find our way in the dizziness of the silence of unfamiliar surroundings. I had expected it to be very cold during the night – we had been told to bring warm clothes. But three o’clock in the morning the air was soft and smooth, fresh and only a bit cool. Finally back at our tent, I admired yesterday’s fireplace in the clear morning light, went inside the tent, and fell asleep again. Before leaving the camp the day after, I enjoyed the sun seeping through our carpet, and the joy of photographing our tent in daylight. The bed was very warm and comfortable, and we were provided with all sorts of bed linen, blankets, duvets, etc. A last look at the camp and the ”restaurant”, then we left what had been the highlight of our journey. The rest of my desert adventures will have to wait for a post of their own. Go for more camping here. Mitt nöje ! Rekommenderas livligt! These are wonderful photos. What an absolutely amazing experience. It was, Miriam! Thank you for commenting! I hope your wish to return comes true. I can understand that! I will remember this too…but maybe not for 30 years. What a great travel adventure! I must admit I enjoyed it immensely. what wonderful photos of a wonderful adventure! Thank you so much! I really enjoyed this tour. I think you are right about the black colour, but I’m sorry to hear he did not like the camel ride! I would do it again any time. I’m not sure if we have those programmes here…but I do know that you would enjoy camping there just as much as I did! And there were no snakes…Thank you for commenting! Amazing experience! Thanks for sharing! What a travel adventure, Leya! :0 The candle dinner and sharing stories by the fire… Wow!!! Oh, my goodness, Ann-Christine. What a marvelous experience!! Looks like so much fun. Well, it was. I would have liked to stay longer…I loved the sunrise and the sunset as well. We were lucky with the weather – some days before there was a sand storm.